First let’s talk about power estimates. If you do nothing to alter the power situation on your property in Lincoln, do you expect your costs will decrease over the next few years, or even decades? Naturally, you expect to pay considerably more for your power ten to twenty years from now. So when you invest in solar panels now, you begin saving money on your utility costs the moment you turn on the power of sunshine! Another discussion point for solar is that we live in one of the brightest states in the Union. And if you discuss the statistics for California and Lincoln, even during the winter, you can count on a number of sunny days when your solar panels continue to generate electricity. And that location efficiency is remarkable, not just for your wallet, but also for the future. The less power you use from the grid, the less carbon that you are putting into the atmosphere. So solar power has a positive effect on the future and it begins from the moment you turn it on. Can solar still get more affordable? With the help of a Solaron sales agent, yes it can! 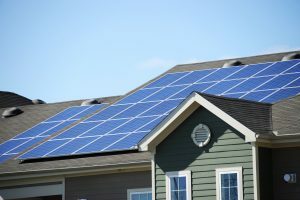 Both municipalities and governments offer various incentive programs to effectively cut the cost of solar installations. These bonuses depend upon your location, but can considerably cut the cost of buying your solar panels. So call Solaron today to get more information about how you can save money and the future by means of solar power!